The metalloids or semimetals are a group of elements that contain properties of both metals and nonmetals. The highlighted elements are the metalloids. Metalloids, also known as semimetals are elements containing properties similar and midway between metals and nonmetals. 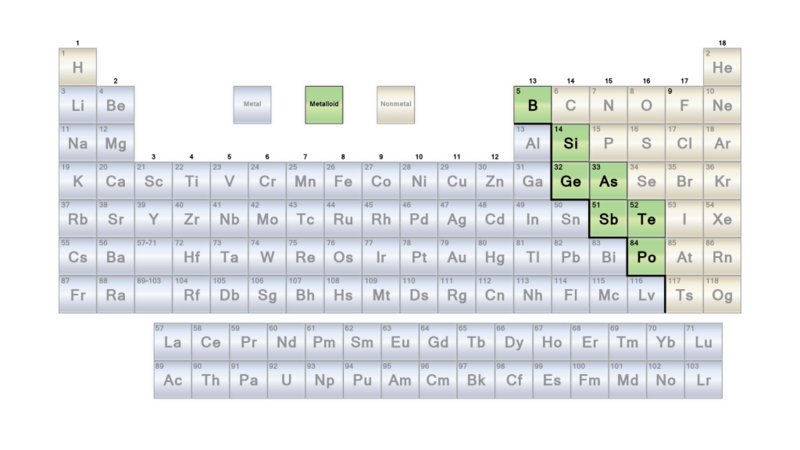 They are found to divide the periodic table between the metals on the left and the nonmetals on the right. This is a list of the seven metalloid elements in order of increasing atomic number. pretty good. Though it needs a bit more traits. I’ll see if I can find more to add. The problem with the metalloids is that they don’t share a lot of common properties, since they are in-between metallic and nonmetallic character. am still not clear on the element astatine is it a non-metal?